This soft cardigan easily folds over shoulders, office chairs, and into your favorite handbag (no judgments here for collecting each color). It’s our favorite “office cazh” option to cozy up in. Plus, it’s totally machine washable. Made in NYC. Looser fitting with a slightly dropped shoulder and relaxed fit though sleeve. Our model in black is 5’9” and wearing a size S. Our model in Granite Grey and Cream is 5’8 ½” and wearing a size S.
Armhole re-shaped and ease added at sleeve cap for movement and comfort. Lengthened hem and elongated drape at front for flattering shape. Our model is 5'11.5" and wearing a size 1X. For more details about the fit of our extended sizes, please see our page About Extended Sizing. 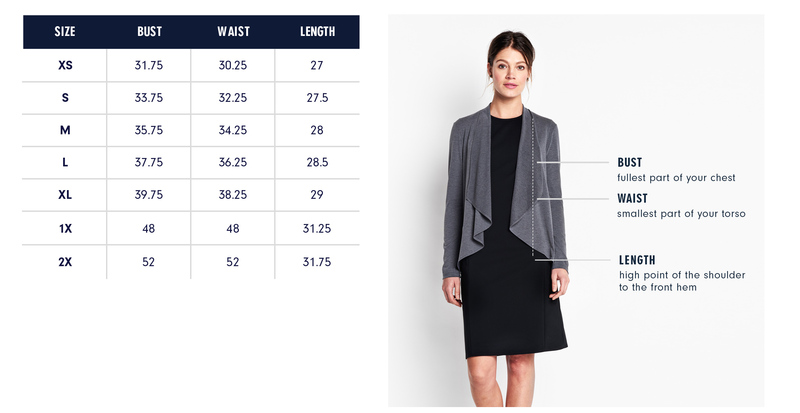 Below are the exact measurements of the Amsterdam Cardigan. All measurements are in inches. For general brand fit, sizing, and measurements, please visit our Brand Fit & Size Guide. All of our clothing is fit to a professional fit model so that we can ensure our garments run true to size and our fit is consistent. Our fit model wears an Of Mercer size 6. She is 5’8” / bust – 35 ½” / waist – 28” / hip - 38”. Our fit model for sizes 14W-20W wears an Of Mercer size 16W. She is 5’8” / bust – 46” / waist – 38 ½” / hip - 48 ½”. Care: Machine wash cold; line dry; cool iron if needed. Do not tumble dry or bleach, cool iron if needed. Dry cleanable. Looser fitting with a slightly dropped shoulder and relaxed fit though sleeve. Hip skimming length. While the shape of this cardigan’s lapel looks simple, it was meticulously draped. During the fitting process I was careful to make sure that each fold fell at the most flattering point for an elongating effect. Features: Asymmetric hem that dips at back.